The Toronto Maple Leafs are in the midst of a restructuring. General Manager Cliff Fletcher was brought in last January to reshape the club. He wasn't able to make all the moves he wanted, but still has wrought significant change. New coach Ron Wilson ranks third among active NHL coaches and eighth all-time with 518 career victories. Wilson has a no-nonsense personality and a defensive scheme that should fit well with the Maple Leafs. Toronto enters this season with a solid No. 1 goaltender in Vesa Toskala and a veteran backup in Curtis Joseph. The Leafs also have a top goalie-in-waiting in Justin Pogge, now with the AHL Toronto Marlies. The defense seems a better than a year ago, and changed once again when Bryan McCabe and a draft pick were traded to the Panthers for defenseman Mike Van Ryn on Sept. 2. A first line of Nik Antropov centering Alex Ponikarovsky and Alex Steen will be huge, but their scoring potential is suspect. Newcomers Nik Hagman, Mikhail Grabovski and Nikolai Kulemin will strengthen the second and third lines, while Ryan Hollweg is a good addition to the checking line. The Maple Leafs are well-stocked in net, for now and the future. Toskala, 31, was acquired along with left winger Mark Bell in a June 2007 trade for three draft picks. He set career highs with 66 games, 33 wins, 25 losses, six ties, 1,649 saves and 3,837:29 of ice time. Toskala went 17-11-2 while playing 30 consecutive games between Jan. 23 and March 29. Toskala backed up Evgeni Nabokov in San Jose for years and was ready to be a No. 1 starter when Toronto got him. He should continue to provide solid goaltending for a few more years. Joseph, 41, returns to Toronto after a six-year absence. The hero of the Maple Leafs' 1999 and 2002 runs to the Eastern Conference Finals is a beloved figure in Toronto, but he is merely a caretaker of the position this time around. The Maple Leafs want Pogge to get another year's experience in the AHL. Toskala played in 66 games and would have played more had he not lost six games in December to a groin injury. Joseph is here to play a dozen games or so, if everything goes according to plan. Joseph went 3-2-0 with a 2.55 goals-against average and .906 save percentage in nine games with the Calgary Flames last year. He played in 55 games for Phoenix two years ago. Pogge looked sharp last season in leading the Toronto Marlies to the AHL's Eastern Conference North Division title. The 2006 Canadian Major Junior goaltender of the year improved from 19-25-2 with a 3.03 GAA to 26-9-5 with a 2.34 GAA in his two seasons with the Marlies. While Toronto feels Pogge might be ready to be a No. 1 NHL goaltender, they have a reliable No. 1 goalie and can afford to give him more seasoning. Consider this: The Maple Leafs used their No. 1 pick in 2005 to take goalie Tuukka Rask. Pogge's development gave Toronto the confidence to use Rask as trade bait in 2006. Tomas Kaberle is the top guy here. Anton Stralman, 22, came over from Sweden to play in the AHL and wound up on the Maple Leafs' roster after December. Stralman has been on an intensive nutrition and bodybuilding program this summer to get his weight up from 180 pounds. Jeff Finger played three years each in the USHL, with St. Cloud State and in the AHL before coming up with Colorado two years ago. He had a very good season in 2007-08 and was signed by Toronto this summer. Finger is plus-22 in 94 NHL games. He has nine goals, 15 assists and only 51 penalty minutes. Van Ryn, who was hampered the last two seasons with various wrist injuries and surgeries, played in 20 games last season before opting for surgery on his right wrist. The 6-foot-1, 198 pound right-hander, who has undergone three wrist surgeries the past two years, admitted last month everything is properly healed and that he's ready for the season. "Van Ryn, as opposed to Bryan (McCabe), is a right-handed shooting defenseman and he's a pretty good offensive-defenseman when healthy and playing up to his game," Fletcher said. "He's ready to go and I believe is looking forward to the challenges ahead at training camp in a couple of weeks." Kaberle is a superb puck-handler and shooter who will see plenty of time on the power play. Kubina is huge at 6-foot-4 and 245 pounds and played well at the end of the season. He missed 10 games in November and December with a knee injury. Carlo Colaiacovo, Staffan Kronwall and Ian White round out the top eight defensemen. Colaiacovo's skills are well suited to the modern game, but he has been felled repeatedly by injuries, including concussions, in his four-year NHL career. White also moves the puck well but is undersized. He is durable and rarely misses a game. He has two NHL seasons of 20-plus points. Kronwall, at 6-foot-3 and 212 pounds, is not as big as Kubina but also plays a physical defensive defenseman's role. The wild card in the Toronto defense planning is Luke Schenn, taken with the No. 5 overall pick in this year's Entry Draft. Schenn is 6-foot-2 and 215 pounds and very mature. He is very good defensively and had 48 assists in his last two seasons with the Kelowna Rockets of the WHL. He was plus-5 at the 2008 World Junior Championship, helping Canada win the gold medal. If the Maple Leafs don't keep Schenn on the roster, they must send him back to Kelowna. You're going to have to buy the team program – you won't recognize this part of the Maple Leafs. 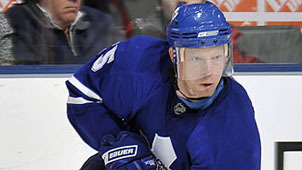 For the first time since 1997, Mats Sundin won't be captain and first-line center. The team wanted to trade him last February but he had a no-trade contract and refused. Thus, the team got nothing for its top asset. Second-leading scorer Antropov will likely move into Sundin's spot, playing with left winger Ponikarovsky and right winger Steen, a fourth-year pro who has yet to score 20 goals in a season. Ponikarovsky had 18 goals last year and 21 in each of the two previous seasons. They won't scare you with their scoring but, combined, they weigh 655 pounds. Matt Stajan moves up to center the second line. He too has yet to score 20 goals in four NHL seasons. Look for Jiri Tlusty on his left wing and Jason Blake on the right side. Blake slipped to 15 goals last season after scoring 40 the year before with the New York Islanders. Tlusty, the No. 13 overall pick in the 2006 NHL Entry Draft, started the season in the AHL and was brought up in December. He had 10 goals and six assists in 58 games. Under-sized center Mikhail Grabovski was acquired from Montreal this summer and will get a chance to play in Toronto, most likely centering the third line between a pair of free-agent signees, left winger Nik Hagman and right winger Jamal Mayers. That could prove to be unworkable because Grabovski is a playmaker and neither of those two players is much of a scorer. Then again, few Maple Leafs forwards have reputations as scorers. The Maple Leafs traded for left winger Hollweg this summer and that should complete a scrappy fourth line with center Dominic Moore and right winger Boyd Devereaux. Nicolai Kulemin arrives after a second strong season with Magnitogorsk in Russia. He spent the summer in Toronto getting acclimated and the Maple Leafs are high on his skills. Left winger Mark Bell has struggled with personal issues in recent seasons. He played for three teams in three years and was suspended for substance abuse a year ago. He then missed 31 games last winter with a broken orbital bone. Bell twice scored more than 20 goals in his six NHL seasons. Left winger Bates Battaglia played most of last season in the AHL and was scoreless in 13 Maple Leafs games. Right winger Jeremy Williams has not proven to be an NHL scorer in three previous stints with Toronto. Left winger Robbie Earl, a member of Wisconsin's 2006 NCAA championship team, had an excellent second AHL season last year and will compete for a job in training camp. His superior speed and history of scoring could help him land a job. * In 181 NHL games, Vesa Toskala has won nearly twice as many games (98) as he has lost (53). Toskala is capable of stealing games. His 33-25-6 record on a team that went 36-35-11 is proof of that. * Pavel Kubina showed steady improvement after returning from a knee injury and combines well with Tomas Kaberle for a decent top defensive pairing. * Jiri Tlusty, the solidly built No. 13 pick of the 2006 draft, has a year of NHL experience after dominating in the OHL and AHL.